You will pay in €. The amount shown for the currency is for information purposes only and is calculated using today's exchange rates. Unable to call? Then you may find the answer to your question in our FAQ section. To conduct this search, please delete any entries in the "Country / Region" field. Get away from the winter blues for an exciting holiday in the snow. Pierre et Vacances offers cheap snowboarding holidays for those new to the sport or an expert in search of an extreme skiing or snowboard holiday; you will find your dream holiday with us. Choose from our snowboarding holiday packages, pack your snowboarding gear and head for the powder or snow park. Snowboarders will have a great holiday at the young and dynamic Les Menuires resort. 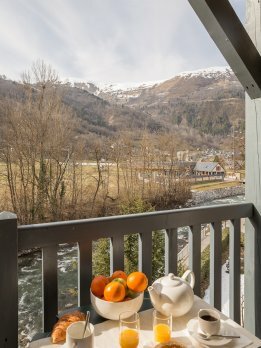 The Residence Les Valmonts, situated in Les Balcons des Bruyère area of the resort, very close to the gondola lift and swimming pool, offers you modern, cosy accommodations. Part of the Three Valleys ski area, Les Menuires is a perfect destination for beginners' holidays as well as for expert snowboarders. Courchevel 1850 is part of the Three Valleys ski area. The Premium residence Les Chalets du Forum offers Alpine luxury in a majestic mountain setting. Relax in a comfortable and spacious apartment with easy access to the pistes. If you’re in need of a break then choose from our last minute snowboard holiday deals. To get away from winter stress and the Christmas turkey, book a last minute Christmas ski holidays. Stay in Les Carroz-d'Arâches for an authentic Christmas experience. Come to Tignes for some exhilarating sensations or pop over to Les Coches to recharge your winter batteries. A dynamic, sporty resort where you can discover the latest winter sports. The ski-in, ski-out residence is located 100 m from the centre. The highpoint of the Trois Vallées and the highest resort in Europe at 2,300 m.
The price shown is per accommodation, for a Studio Eco-Standard 4 people from Sun 28 Apr to Sun 05 May 2019 . A revitalising, sunny resort at the foot of Europe's biggest skiable glacier. The residence's location near the lifts to the glacier. Fitness centre nearby: sauna, hammam, whirlpools and more. The price shown is per accommodation, for a Studio 4 people - Cabin and mountain view from Sun 21 Apr to Sun 28 Apr 2019 . The price shown is per accommodation, for a Studio 4 people - Cabin from Sun 21 Apr to Sun 28 Apr 2019 . The Principality of Andorra is a paradise for shoppers and fans of après-ski. Access to Grandvalira, the largest ski area in the Pyrenees. Extensive choice of outdoor activities for all ages. The price shown is per accommodation, for a Studio Standard 3 people from Sun 21 Apr to Sun 28 Apr 2019 . An authentic village in the Pyrenees with access to the Saint-Lary-Soulan ski area. A residence with cosy apartments in the heart of the resort. A resort in the Pyrenees renowned for its thermal baths, which can be accessed directly from the residence. The price shown is per accommodation, for a Studio Standard 4 people from Sun 21 Apr to Sun 28 Apr 2019 . A charming holiday village at the gateway to Andorra in the Pyrenees. A town centre residence, near the thermal baths and shops. At the foot of the gondola lift leading to the Ax-Trois Domaines ski area. The price shown is per accommodation, for a Apartment Standard 1 bedroom, 4 people from Sun 21 Apr to Sun 28 Apr 2019 . Ideally located 300 m from the ski lifts. The dynamic resort offers a number of winter sport and off-slope activities. The price shown is per accommodation, for a Studio Eco-Standard 4 people from Sun 21 Apr to Sun 28 Apr 2019 . A warm, family-friendly, pedestrianised resort combining forests and pastureland. Ski-in, ski-out, and only 100 m from the ski lifts. In Savoy, at the heart of the Espace Paradiski ski area. The residence's indoor pool and saunas. The price shown is per accommodation, for a Studio Eco-Standard 2/3 people from Sun 21 Apr to Sun 28 Apr 2019 . Subscribe to our newsletter and we'll welcome you with a special discount code! The email address is incorrect. You are almost registered! Click on the link in the confirmation email to complete your registration! You'll receive your welcome discount code for first timers within 24 hours. You will now receive an email subscription confirmation. Click on the link in this email to complete your registration.